Audience: 100 in a 600 capacity room. 1999-04-27: Alte Fauerwache, Mannheim, D Setlist! Backstage pass! 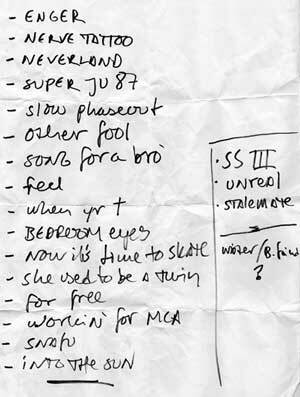 1999-04-30: Bloom, Mezzago, I Setlist! 2 song for a bro. 1999-06-28: Zelle, Reutlingen, D Bent's Setlist! 1999-07-01: Zollhaus, Leer, D Setlist! 1999-10-22: Garage, Bergen, NO Setlist! 1999-10-23: Garage, Bergen, NO Setlist with indication of instruments and tunings! Cranberry? Sauce? E-riff? Nile Bass and City? 10. Song For A Bro. 6. Song For A Bro. 07. Song For A Bro. you lied -> b. to c.
2000-10-17, Folken, Stavanger, NO Setlist! 13. Song For A Bro. Open Your Eyes(?)  introduced as a song by the monkees? As of the end of this tour, this setlist page is no longer maintained, post all setlists on the setlist forum.